You and your cake will take home first prize at the costume party with these DIY ideas. If you ask me, you don’t really need an excuse to make cake, so think of this as just an added incentive to bring some sweet and spooky DIY goodness into your life. With these crafty cupcakes, you’ll be impressing your friends and pleasing your tastebuds in no time. And the best part? You don’t need any crazy baking supplies to do it. With these cupcakes, you are sure to get a good response. By using glass candy and sweet edible blood, you can create these frightening delicacies that look horrifying but taste great. Head over to EasyBaked to figure out exactly how. Frosting and a toothpick is all you need to make this iconic Halloween masterpiece. With just a little added effort you can bring the Halloween spirit to an otherwise ordinary cake. Check out the steps to do it here. Take your love for candy corn to the next level. 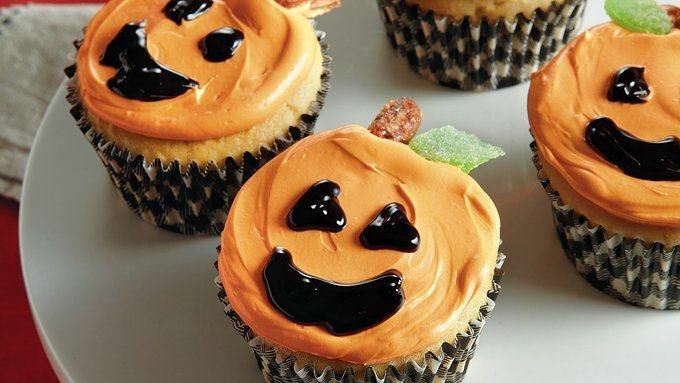 Food coloring is all you need to transform plain cupcakes into these Halloween-themed ones. This post will show you the trick for making these treats. Sometimes classic is the way to go. With a little skill, some colored frosting and a few green gumdrops, you can serve adorable jack-o-lantern cupcakes to your friends (or yourself) this Halloween. Check out Tablespoon for some tips and tricks to getting these just right. Tombstone cookies + chocolate dirt = frighteningly delicious. You can create your own version of this creepy cake this Halloween. Check out this article to find out how to give your tombstone cake a killer appeal.